Rhinoplasty is a cosmetic surgery that corrects defects of the nose. For some people, this involves making the tip of the nose less bulbous. For others, it could mean removing the dorsal hump. No matter the reason for considering rhinoplasty, it is a significant procedure that entails consultations with the best rhinoplasty specialist in your area, follow-ups, and much needed healing time. You may or may not experience pain. Anesthesia administered during your surgery will prevent you from experiencing any pain. However, you may experience discomfort in the days that follow. There are, however, some people that feel no pain at all while they heal from their nose job. It depends on your body and how it responds to pain. You’ll receive prescription painkillers to help deal with any discomfort. If the pain is minimal, you can take over-the-counter medicine like Tylenol or Advil. Your nose will be completely bandaged following your procedure. Your surgeon will explain how to care for the incision site and when you can remove the bandages. You’re going to look like a mummy for a few days, but the results are worth it. Your nose will be swollen for days or weeks after your rhinoplasty procedure. It’s completely normal that swelling does not go down immediately following surgery during recovery. Do not wear glasses for the first month after surgery. Your nose can not support eyeglasses or sunglasses for a while. If you do wear glasses, it’s best to wear contacts during the first month of your recovery period. Find the best rhinoplasty specialist. Many excellent cosmetic surgeons are specialized in multiple fields and have only performed a handful of rhinoplasties. 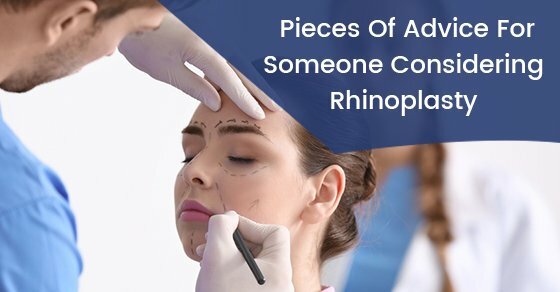 You want to find the best rhinoplasty specialist because it means they have performed many of these procedures and understand different nose types. This is especially important if you are considering ethnic rhinoplasty or male rhinoplasty. The cartilage and skin around the nose are different for men and women and for people of different ethnicities. The best rhinoplasty specialist knows this and will do a great job no matter your background. Rhinoplasty isn’t for everybody, but it can help boost your self-esteem and make your nose more visually appealing.